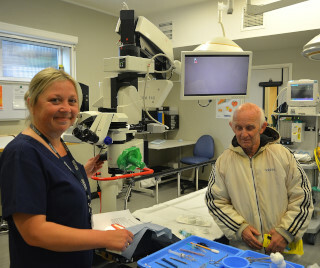 Staff at the Jethro Arscott Unit staged an open day to demonstrate the sight-saving techniques now performed in ophthalmic day surgery. The unit, equipped by the League of Friends of Bexhill Hospital at a cost of more than £550,000, opened in 2014. Last year more than 1,800 patients received treatment in the unit's theatre. As visitors made their way from the unit's reception and waiting area and through the diagnosis and treatment areas to the recovery they passed publicity displays by Hastings and Rother Voluntary Association for the Blind and by the league. 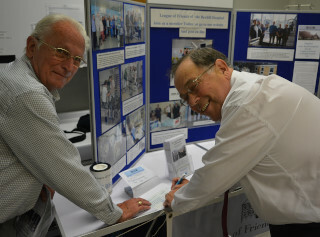 The League's photo display board included illustrations not only of the day surgery unit and its staff but shots taken at photo-calls following other league gifts for the benefit of local patients. 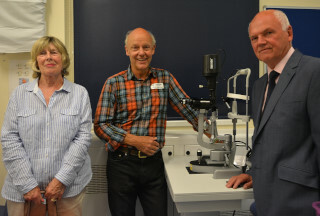 Consultant Mr Peter Gregory was demonstrating how the same laser technology which guides “smart” bombs to their target is revolutionising the way he and colleague Mr Pieter Gouws correct eye defects. Unit matron Lesley Carter, Sister Jo Tucker, Staff Nurse Sally Moon and Ophthalmic Surgery Patient Care Practitioner Lucinda Reese were kept busy in theatre all afternoon answering visitors' questions. Centre of attention in the theatre was the new microscope bought by the league. The league agreed to fund the £77,897 instrument so recently that league treasurer Chris Ashford took the opportunity to get chairman Cllr Stuart Earl's counter-signature on the cheque while the pair helped man the league display. The new microscope replaces one provided among 20 other items of equipment in the original league purchase two years ago. That first instrument has been transferred to the eye unit's inpatient operating theatre at the Conquest Hospital to replace a microscope deemed unsafe for further use. The new Leica F40 device offers advances over its predecessor. It has two screens, allowing not only the operating surgeon to see what he is doing under great magnification but also trainees. By inserting a memory stick, operations can be filmed for future use. Throughout the unit, information sheets guided visitors through the intricacies of its work, explained other equipment purchased by the league and led them through to the recovery area where, among other things, they were able to try their skills - using surgical instruments to peel grapes! 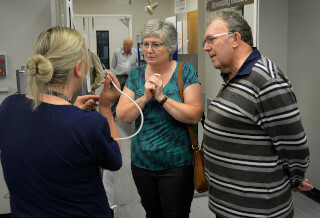 For the staff, the fact that 94 people took the trouble to tour the unit and ask so many interested questions was ample reward for a busy afternoon designed to raise public awareness of the unit's achievements. For one visitor the afternoon had special resonance. Until her retirement 10 years ago Janet Powell was theatre sister at Jethro Arscott Unit. It was then used for general day surgery. “It's changed a lot since then,” said a fascinated Janet.